An ordinary trip to the grocery store turned into gasps of 'ooooh' and 'aaaaah' when I spotted the beautiful hydrangea bushes being offered for sale in the produce/floral area. How boring to spend my money on chicken and rice and such when I could bring home one of these instead!! After all, the family could sit on the deck and eat cereal or sandwiches while gazing upon these beautiful blossoms, right? A great trade-off, if you ask me! There was a wide selection to choose from... some pink, some blue, and some a combination of blue and green, which is what I chose... It's still sitting on the deck, waiting for me to decide the perfect place to plant it. Pete is vintage whereas Re-Pete is new, but they haven't let their huge age difference keep them from becoming best of friends. Wishing you all a lovely weekend!! I hope to get some flowers in the ground, if the weather cooperates!! Pete & Repeat are so cute! We saw an escaped Pete the other night on our roof. Hopefully he found his way home safely after visiting us. 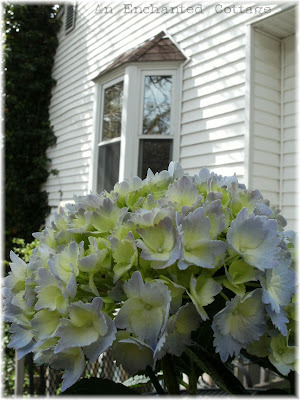 Love, love, love the hydrangeas. I'll take them over chicken and rice any day! I have some small blooms on mine, but it's only a baby. Next year it should be much more lush. Beautiful flowers and love Pete and Re Pete too! Blue, green, & peachy pink...it doesn't get any better than that!!! Love the hydrangeas!!! 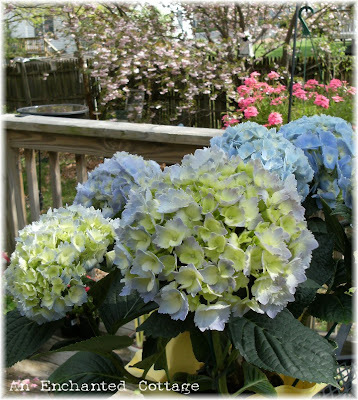 I love the hydrangeas, the colors are so pretty! I'm sure your family won't mind a little cereal, if your kids are anything like mine they will probably not even blink. 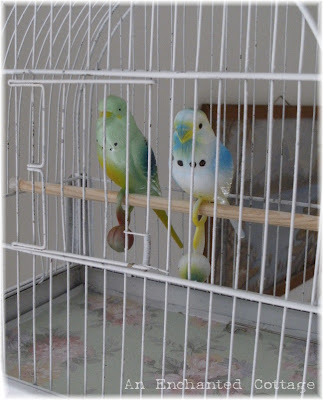 I have a blue and green Steiff parakeet that had a wicker birdcage in my room as a child. 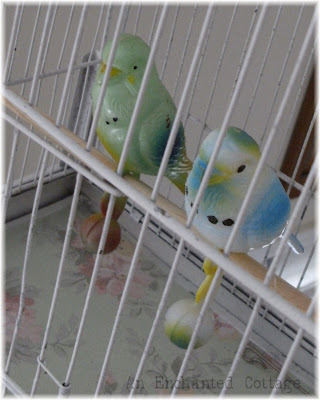 Still have the bird but the lovely cage is long gone! Thanks for sharing yours they are so cool! Hey Donna; OH how sweet Pete and Re Pete are Love the bird cadge too. Your flowers are absolutely gorgeous. WOW.. and your birds match. KISMET! Haha, Pete and Re-Pete LOL. Those little fellows are cute :) Beautiful flowers also! I remember planting rusty nails with Granny to keep the blue ones from turning pink... mercy, the things we did back in the day. There are much safer ways to keep the soil acidic, LOL! Your going to overwinter your plant and then set it out next year, right? If it's not too much bother. I am not sure if that's what you said. It sure is a beauty. I noticed my grocery store had lots of them. too. so convienient! That is a great pairing: blue and green. Both such tranquil colors. I love your birds. No cheeping? My hydrangea died last year. I've been looking for another one to replace it. I think this seals the deal. Now I MUST have one! 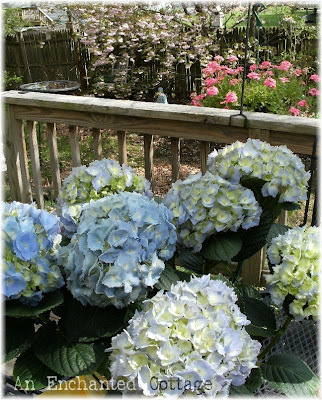 Love those hydrangeas! They are one of my favorite flowers! I especially love the blue. They look beautiful on your deck! Beautiful flowers! 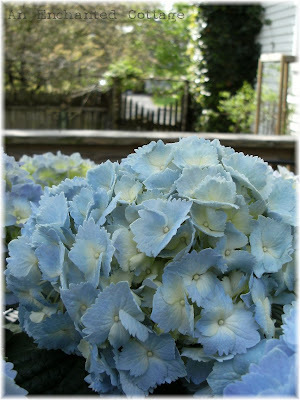 I just love hydrangeas!